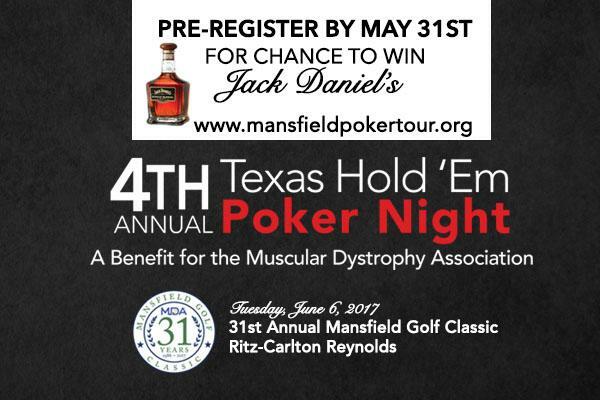 As you make plans to attend the 31st Annual Mansfield Golf Classic benefiting the Muscular Dystrophy Association, please take a moment to pre-register for the 4th Annual Ed Tessaro Texas Hold’em Tournament. This event will be held in conjunction with Casino Night on Tuesday, June 6th at Reynolds Lake Oconee. Whether you’re a serious Texas Hold’em player or never played a hand, you are sure to have a good time while contributing to our wonderful cause. The tournament is open to all who’d like a seat at the table for a suggested donation of $200. Pre-register by May 31st to participate in the Tuesday night play-in and you’ll be entered into a drawing for a commemorative bottle of Jack Daniel’s Single Barrel Tennessee Whiskey, signed by the master distiller. All donations raised from this poker event will go directly to MDA for the benefit of ALS research. Click here to pre-register in the section labeled Greensboro, GA, the host city of the golf classic activities. The top players from the Texas Hold’em play-in at Reynolds will join the 3 players who’ve already secured a championship round seat from play-ins held over the last few months. Up for grabs during the championships is $5,000 in gold coins and cash, provided by our event sponsors. See you at the Mansfield Golf Classic! Mansfield Cares, Inc., is a 501(c)(3) non-profit organization. Proceeds from Mansfield Cares events go to MDA and other Mansfield Cares charities. The 33rd annual Mansfield Cares Golf Classic is scheduled for June 4-5, 2019, at Reynolds Lake Oconee, Greensboro, Georgia. Learn more at www.mansfieldcaresgolfclassic.com. Mansfield Energy, the largest delivered fuel supplier in the nation, offers a broad range of solutions including fuels, natural gas and energy price and data management services. Founded 60 years ago, Mansfield delivers over 3.5 billion gallons of fuel and products annually to 4,000 customers across the U.S. and Canada. @ 2018 Mansfield Energy | All rights reserved.